This was disclosed by Prime Minister and Minister of Finance Dr Ralph Gonsalves during a press briefing last week. Gonsalves said that, despite this setback, he was still optimistic that the needed money will arrive in time for the airport project to continue and be completed as promised. 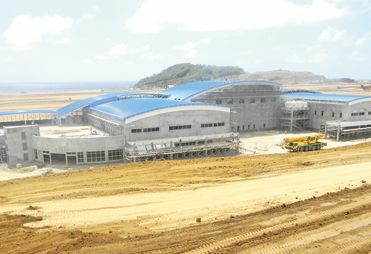 The Prime Minister, in Parliament earlier this year, had indicated that the airport project would require another US$80 million to be completed. âSome of the monies I was hoping to have in my hand already, because we have identified the various sources and had all the agreements,â Gonsalves told members of the media. âBut some of the sources have been taking a little bit longer to get the money up front,â he added. For example, he said, there were delays in the $10 million promised by the government of Venezuela, but this was due to the events which took place in that country, including the ill health and eventual death of that countryâs former leader, Hugo Chavez. This was followed by the two presidential elections, Gonsalves explained. Everything was, however, now moving smoothly in relation to the $10 million, Gonsalves said, indicating that all the formal approvals were to be granted last Friday and the money should be transferred to the Vincentian government by this week. Gonsalves also said there were some delays with the sale of $20 million worth of lands, but he said that the first tranche of money from that sale was to be received shortly. So too, other sources of funding from financial institutions were being worked on, the Prime Minister said.